If you’re a student, you should work hard to be a strong writer. Unfortunately, while some people have a natural ability to express their ideas on paper, others struggle, whether due to limited vocabulary, poor grammar, or simply confusion about what distinguishes strong writing from weak writing. Does this sound like you? If so, it pays to take a college writing class. Most schools offer extra classes for students who are willing to boost their writing skills. Attending one could be very important for your future. If you know that you’re not a strong writer, you might have considered trying to develop your skills on your own. While this is an admirable choice, without help from an expert, you might waste a lot of your own time trying to determine which tools and resources will help you learn the most. In a class setting, you’ll have an experienced instructor there to answer your questions, structure the lessons, and help you reach your goals faster. No matter what subject you study, you’ll have to write essays during your time as a student. 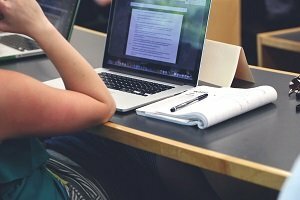 Even if you’re an intelligent person with a thorough grasp of the subject matter, you could still get poor grades in your classes because your weak essay-writing skills have brought you down. By seeking help and taking an additional class, you’ll improve your grades. This will pay off in the long run when potential employers learn that you have performed well in school. The truth is, being a strong writer may even be more important after you graduate. In your career, you’ll constantly be communicating via written language. Sometimes you’ll be sending emails. Sometimes you’ll be drafting up reports for your supervisors. Sometimes you’ll submit cover letters to companies you hope to work for. Basically, writing is something you’ll be doing throughout your entire life. Employers look for people who write well. This tells them that they’re dealing with a smart person who communicates with maturity and precision. Attending a writing class may make the difference between landing your dream job or settling for less. Prior to college, your teachers might offer help if they saw that you were struggling with a particular topic or skill. In college, however, you’re more likely to be treated as an adult. Your professors will assume that if you have any difficulties, you have to take some actions to address the problems. Ask yourself if you’re honestly a strong writer. If not, a special writing class can help.